"We have learned a lot through Bible studies held in our churches by our Sunday School teachers trained by World Vision (Matlameng Area Development Program). We now know different verses from the Bible and know the importance of prayer in our lives as children,” said Lineo, 8 holding the Bible. "We were living in houses that were not in good condition, that could even fall on us. World Vision (Matlameng Area Development Program) has constructed 2 classrooms for us and we are very thankful that we now study in a conducive environment,” said Raboletsi, 13 (wearing white shirt at the back). "We would like to thank World Vision Matlameng Area Development Program for constructing woodshed with all materials needed for it. We are now able to shear our sheep to sell wool and mohair in order to generate income to buy basic needs for our families," said Khauhelo, 53, scaling wool. "World Vision (Matlameng Area Development Program) provided us with a greenhouse. We now produce vegetables all year round and provide food for our family as well as selling to generate income to provide needs for our family,” said Thabo, 32 (wearing woolen hat). “We would like to thank World Vision Matlameng Area Development Program, for caring for our education needs. We now have school bags to carry our books to school and we no more use plastic bags which tear up and scatter our books all over. We received the math set which makes it easy for us in math class," said Nthabiseng. "After I received this ram, I produced a quality of wool. This helps me to generate income through the sale of wool," said Mphaka, age 45 years. "We really thank World Vision for providing us with house and store room for us to keep our juice which we produce to help vulnerable children with school needs with the money we earned." said Mamaqholo, age 52. "We thank World Vision for providing us with juice maker machine. We produce juice which we sell and help vulnerable children with school needs," said Mamaqholo. "Thanks to World Vision for providing us with two class rooms. Our pass rate has just improved," said Poloko with blue sweater age 12 years. "After this training we will be able to enhance reading and writing skills to our students so this will improve our school performance," said Ts’epang, age 38 years. "Thanks World Vision for this training because our saving group is going to improve and we will be able to save enough money to support our family and assist vulnerable children with health needs," said Mohapi, age 35. "Thanks to World Vision for providing us with two class rooms. We used to share a class with other grades and we were not able to learn. Our pass rate has now improved," Mantsoili, age 12. “It was not easy to read in our own at home. Now we meet with children from other schools and help each other.” Mpenyana, 8, at the community library. “After learning about feeding babies and young children, our children are now well nourished. These nutrition packages motivate us to continue with proper feeding practices.” Neo, a mother. “I did not want to attend school because my school uniform was torn. But now I feel confident and can concentrate better in class.” Relebohile, 14, right. "Sometimes, we had to go to school without eating. But now we feel really blessed to have neighbors who support us with farm products.” Reatile, 14 years old. Children used to seat down on the floor due to insufficient classrooms and desks. "We are happy to sit comfortably on our new desks and new classroom block built by World Vision," commented smiling Teboho, aged 10 with the black bottled neck jersey. "I enjoy meeting and playing with my friends Thabo, Moeketsi and Lipolelo at our Pre School" said Sello a sponsored child aged 5, with a smiling face seated in the middle after receiving the new tables, chairs and teaching aids from World Vision. "Boys and girls can now access various books and assist one another with assignments after school, weekends and holidays" said Malineo the community volunteer leading one of the community library established by World Vision. "We promise to wash our bodies and clean our teeth at least once daily" shouted boys and girls happily waving their new towels and tooth paste from World Vision, after being trained and encouraged to practice good personal hygiene at all times. At World Vision's community reading programs, children help one another with homework assignments and practice reading library books. At World Vision Matlaneg ADP reading programs, children, ages 4-12, read, sing, and play many different activities. World Vision supported the local community with a bread oven to produce bread and sell to the customers within the local communities. The profits observed are used to support family needs as a group, and also the needs of the orphans and vulnerable children in their care. The boys and girls who are members of the Child Parliament formed a circle that symbolizes the community. As they sing, they promote care and support on the topic of disaster risk, participation in capacity building within vulnerable communities, and building community resilience. Likeleli (15), a member of the Children’s Parliament, presents children’s views on the causes and effects of soil infertility and erosion. She says when animals graze in the same place for a long time, the lack of grass causes infertile soil, and when it rains, the soil erodes. Popotelane (16) is one of 36 girls and boys who are members of the Children’s Parliament. He leads a discussion about child-led Disaster Risk Reduction, focusing on the causes and effects of drought. The aim of this group is to create awareness about disaster risks. 60 children from local communities attended the Children's Parliament. They were divided into two large groups to share their views on the qualities of good leadership. This child-led advocacy initiative was started to promote child participation, communication and quality leadership skills. Pulane (16), a Children's Parliament representative serving as Deputy Minister of Education and Training, notes overcrowding in primary school classrooms. She also says that children with disabilities were marginalized in the past but should be accommodated regardless of their status of life. Thapelo (17), a Children's Parliament representative serving as Minister of Education and Training, presents a new strategy to improve the primary schools’ feeding program. This committee promotes child participation, governance and decision making, and the enforcement of laws benefiting children. 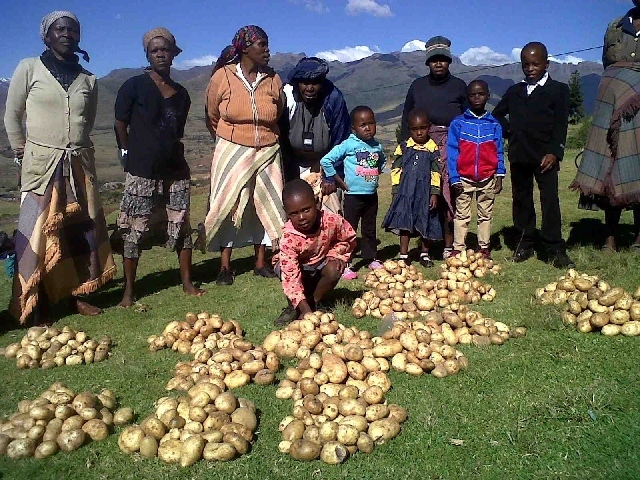 Farmers that were supported with potatoes seeds by World Vision shared their produce amongst orphans and vulnerable children. “All 50 boys and girls that we support in our area will receive 7kg of potatoes each.” said Mrs. Pheello one of the farmers with a red hat. "Let the children come unto me!!!" shouted one of the sponsored children up front as he read from the Bible. They were given those Bibles by World Vision at school with the aim to nurture the spiritual being. These Bibles will help them to improve their religious studies at schools. 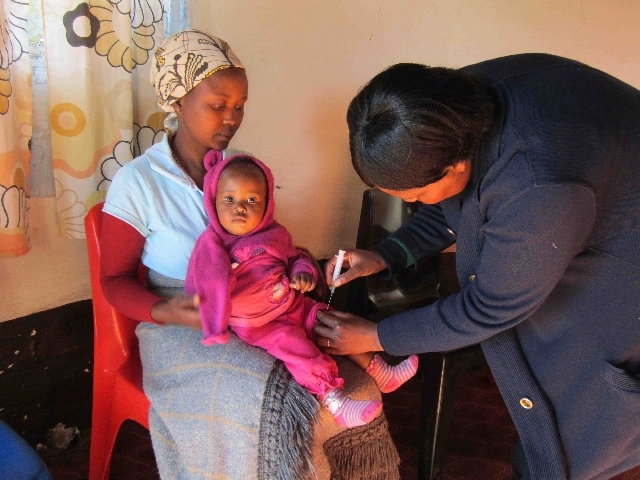 "I am very grateful for my child to receive the required vaccination at the right time without travelling longer distance to the clinic" said Malimakatso (the mother) aged 22 while attending the vaccination campaign organized by World Vision. The school was assisted with two roomed block and desks with the aim to improve learning environment and performance of children. “We are grateful with the new building from World Vision and hoping to get the best results” said the smiling boys and girls in front. Boys & girls from 14 primary schools were engaged in literacy competitions on reading, debate, essay writing & poetry. “We will be able to produce crops in our school gardens & use the kits to carry our books safely.” said Lerato, a sponsored boy aged 12 on the right hand side. “ I received 2 piglets and starter feed from World Vision. I managed to breed and 7 piglets were born. I passed-on two to my neighbor who did not receive any. Now I am producing for marketing” said Paseka aged 25, one of the beneficiaries. Community leaders who take lead in child protection care & support were trained on Savings Groups by WV, so that they can save the little money they have & issue out loans to group members. This is done so that they can accumulate funds to provide for their families & also support OVC in their care. Village Disaster Management Teams members were trained on first aid so that minor accidents that occur in the villages and during agricultural activities can be prevented from escalating into major ones. Children can face life challenging issues on their own, if capacitated enough with life skills. "We promise to be better people" commented Teboho 18, with a white top in the life skills training conducted by World Vision. This also helps them to cope with dear everyday life. Take a look at everyday life in your sponsored child's community to better understand where they live and the joys and challenges they face. 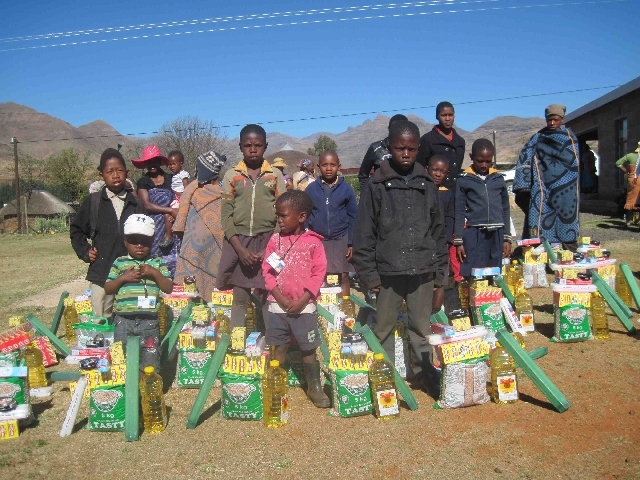 "We are very thankful to World Vision because we will no longer go to school with empty stomach," said Thabiso, with a black jacket upfront after receiving some food packages in the form of 5kg beans, soup, candles, laundry soap, polish and tooth paste. "We can now wear the school uniform like other and even have extra clothes to change at home," commented Thandi the sponsored child as one of the beneficiaries after receiving clothes sewn by the Coalition. "We feel privileged that amongst all orphaned and vulnerable children (OVC) that struggle to get some food to eat, we were nominated as the beneficiaries" said Malineo after receiving 10kg of potatoes from World Vision. Matlameng Area Development Project (ADP) in collaboration with the Ministry of Health conducted an outreach in those areas after realizing that most of the children were vulnerable to unnecessary illness. Pulane’s mother was so happy because the child received what she deserved. “Those horrible days are gone now; we had to squeeze ourselves into a very small classroom during the windy, cold and rainy days due to insufficient classrooms. Our new two classrooms block constructed by World Vision at Nkoeng Primary School has got all the positive responses for the past situation." Close to 18 primary schools participated in the debate and comprehension competitions. "We are very happy to receive the school kits," said one of the children who is 9 years old. 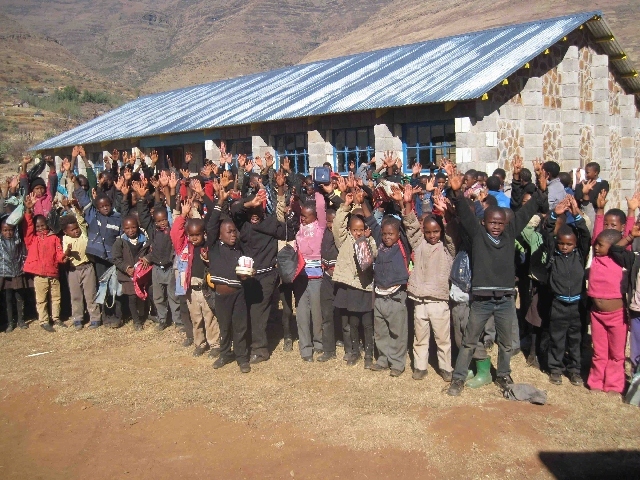 These students just received an award of school kits and learning materials from World Vision. Children's rights are better respected. A total of 34 children and 36 adults attended training to learn about the rights of children and child protection. Children and community members now know how to report cases of suspected abuse and other harmful incidents that may occur within the community. More children have access to vaccinations. A mobile clinic provided rubella vaccinations to 6,500 children between the age of 2 and 13. An additional 240 immunizations were given to children under 5, resulting in most children in the community now being fully immunized. In order to improve hygiene and sanitation for children at school, we rehabilitated and constructed new latrines at a primary school, benefiting 433 kids. Boys and girls attend better-equipped schools. An additional 2 classrooms were constructed at a primary school, giving 722 children more room to learn. Now they are motivated and their grades are improving. Educational toys were also provided to 22 preschools, helping to teach 234 young children early learning skills. Children have more trained leaders to teach them about their faith. A total of 19 spiritual leaders participated in child protection and gender equality training and then shared the information with their congregations. An additional 36 community volunteers were taught child monitoring skills. In Matlameng, the economy depends on farming—primarily corn, grain, and wheat—and raising livestock. 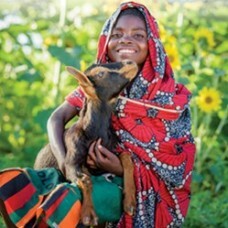 Cattle are raised to plow fields or provide milk, and sheep and goats are raised for their wool. However, limited agricultural support, an inability to afford farming equipment, the use of outdated techniques, and unpredictable weather patterns have resulted in low crop production, despite good soil conditions. Many families are left hungry and unable to afford basic needs. When parents struggle to put food on the table, their children’s health often suffers. Food shortages, scarcity of clean water, and poor sanitation and hygiene—as well as knowledge about these topics—mean children are vulnerable to easily contract preventable diseases, which far too often result in increased child mortality rates. Another health challenge is HIV and AIDS. The disease has impacted many families, either leaving children to fend for themselves or making adults too weak to work. Community members have access to health clinics, although these are typically understaffed, unsanitary, and lack health equipment. Since 2000, primary education has been free, but some children are forced to drop out when their parents cannot afford additional expenses, such as school supplies and uniforms. Parents often do not understand the value of education, so they force their children to stay home to help with household responsibilities or to find work, which increases their risk of exploitation. Children who do stay in school do not necessarily get a quality education. Schools are overcrowded, lack furniture, and teachers are inadequately trained. Some schools are located across rivers and become inaccessible during rainy seasons. 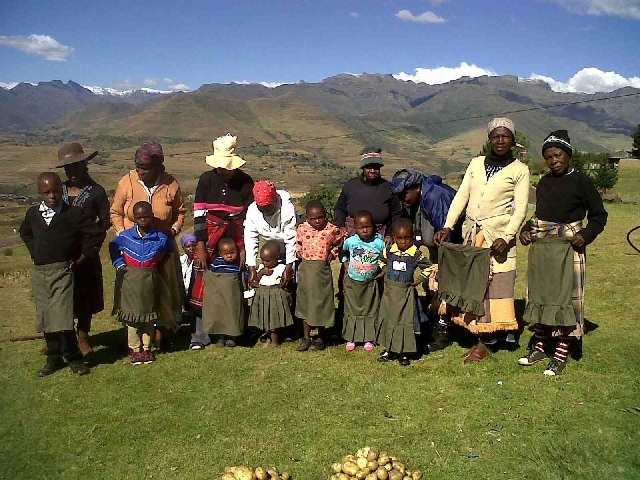 Your gift in any amount will provide help and hope to struggling families in Matlameng, Lesotho. WorldVision is working alongside people in this community to develop tools and resources needed to help them build a better world for their children. Your gift will allow them to accelerate important projects aimed at meeting their critical needs. Together with the support of our generous sponsors, your gift will help this community become a place where children can grow and thrive. – Children's protection, especially in war-torn areas. – Health and well-being for people living with HIV and AIDS, and support for their families and communities.